Skirt has side zipper and waistband. Views 1 and 2 consist of ten-pointed skirt section. Short length, View 1, has five sections of one fabric and five sections of a second fabric. Below knee length, View 2, is made of five different fabrics. 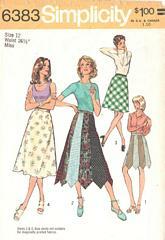 View 4 is a bias skirt and not suitable for diagonally printed fabrics. Pattern is cut and complete. Envelope and contents are in good condition.